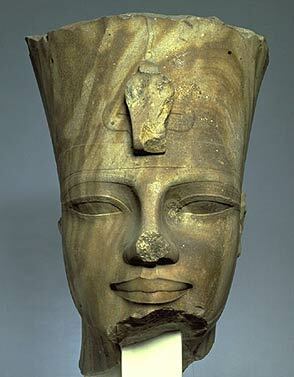 The reign of the pharaoh Amenhotep III marks the zenith of ancient Egyptian civilisation, both in terms of political power and cultural achievement. As the son of Tuthmosis IV and his minor wife Mutemwia, Amenhotep became king at around the age of 12 with his mother acting as regent. Early in his reign he chose the daughter of a provincial official as his great royal wife, and for the rest of the reign Queen Tiy featured prominently alongside the king. Having inherited an empire that stretched from the Euphrates to the Sudan, Amenhotep maintained Egypt's position largely through diplomacy and intermarriage with the royal families of Mitanni (Syria), Babylonia and Arzawa (Anatolia). He was the first pharaoh to issue royal news bulletins about his marriages, hunting trips and building projects, the information being inscribed on large stone scarab seals and sent out across the empire. At the imperial capital Thebes, the king's sprawling palace at Malkata lay close to his funerary temple, the largest ever built with its original location marked by the two 'Colossi of Memnon' statues. A vast harbour and canal network linked these buildings to the Nile and allowed direct access to the king's new temple at Luxor and the great state temple of Amun at Karnak. Although Amenhotep greatly embellished Karnak as part of his nationwide building programme, the growing power of Amun's clergy was skilfully countered by promoting the ancient sun god Ra. The sun was also worshipped as the solar disc the Aten, with whom the king identified himself by taking the epithet 'Dazzling Aten'. Amenhotep III died in around 1354 BC and was buried in his huge tomb in the secluded western branch of the Valley of the Kings. He was succeeded by his son Amenhotep IV, better known as Akhenaten.